Preheat oven to 180° C. Butter a 9×13 casserole dish and set aside. Take cream and butter out of the refrigerator to bring to room temperature. Melt 100g butter in a large saucepan over medium heat. Add 3 cloves of diced garlic, 1 chopped onion and a pinch of fresh rosemary. When onions begin to brown, add flour. Cook, whisking for 1 minute. While whisking, slowly pour in cream and milk and add 1 teaspoons salt and 1 teaspoon pepper. Continue cooking (and whisking), until the mixture thickens. Remove from heat. Stir in 150g Barrys Bay Wainui Special Vintage cheese, until you achieve a rich blended cheese sauce. Put aside the remaining shredded cheese to be added at the end. Cook macaroni for slightly shorter than the manufacturer’s directions, leaving the noodles just undercooked (approx. 2 minutes less). Drain pasta and rinse under cold water. Add salt and pepper to taste and 30g butter. Return the noodles into the cheese sauce and stir until well mixed. 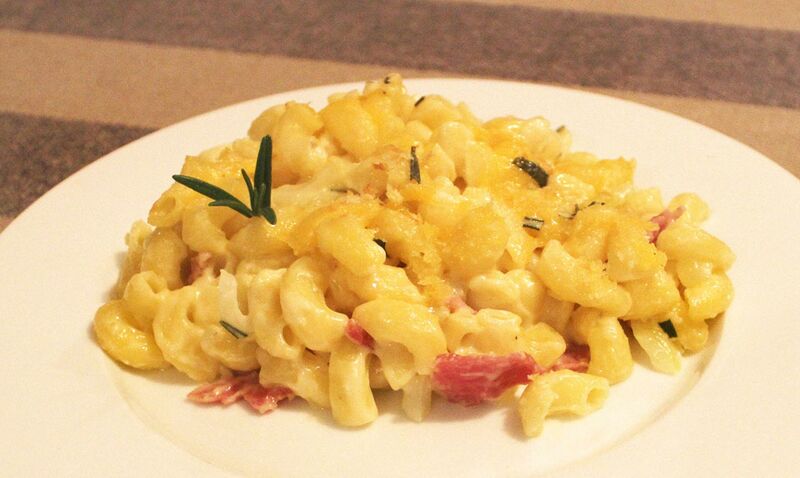 **Dice cooked bacon and add to macaroni and cheese if desired. Pour macaroni and cheese into your grease casserole dish. Sprinkle remaining mixture of shredded cheese (50g Wainui Special Vintage and 50g Canterbury Red) on top to give a bit of orange colouring to the dish. Finish with a handful of bread crumbs, just enough to cover the top of the dish. Bake until the breadcrumbs have created a golden crust on top, about 30 minutes. Remove from the oven and let cool for 5 minutes. Garnish with fresh basil and rosemary.